The Second Circuit Court of Appeals dismissed a legal challenge to DEC’s denial of the controversial Constitution Pipeline, which would have carried fracked natural gas across 251 waterbodies and through the Hudson River Valley. 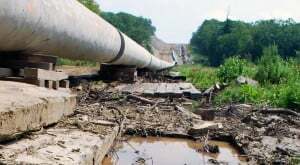 The NY Department of Environmental Conservation must deny a key approval necessary for construction of the next phase of the Algonquin Pipeline, the Atlantic Bridge project. In response to environmental and public safety concerns about the AIM pipeline, Algonquin has asked that the gas be turned on next Friday.